One of my favorite places to eat before going gluten free, was Chick-fil-a. Uggh, I have to say it is very painful to watch my kids eat there… It is usually a special treat that my husband does with them. I find that this chicken is even more tasty and flavorful. Not to mention healthier because it is gluten free and baked! Whisk eggs, season with salt and pepper. 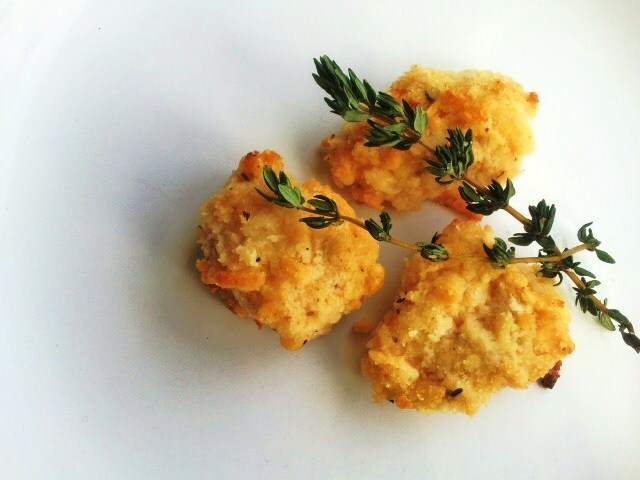 Combine almond flour, Parmesan, salt, pepper, garlic and thyme. Coat chicken in egg mixture. Place chicken on a greased or lined baking sheet. Bake for 15-20 until cooked through. *I like to spray the chicken with a little bit of olive oil/cooking spray right before cooking to help give it that golden color. Meal ideas: this chicken is delicious on it’s own with some roasted veggies, great sliced on top of a Caesar salad, or served along side spaghetti squash and marinara sauce. Part II: You picked your pumpkins, now what? oooooooh! I LOVED Chik-fil-a too! I can’t wait to try these! Hey seester! Have you tried these without the cheese? How is it? I am trying to eliminate dairy for Callie’s sake (I also have been trying to cut out dairy personally when I can). Lemme know! But it looks yummy! I made these tonight and was surprised how great they were! I shouldn’t be surprised though – everything I have tried here has been amazing. Once again, thanks Michelle for delicious food that doesn’t make me sick!! :) I also made the asparagus with it …cooked it in the oven at the same time – perfect! Thank goodness I’ve found this website. I tried this particular recipe tonight and it’s the tastiest chicken recipe I’ve been able to make since going gluten free. I’m not sure why, but Michelle’s recipes seem less intimidating to me than many I find elsewhere. This website is a godsend! My 15 year old son is on a gluten free diet and this is my favourite site because it’s one-stop-shopping, the recipes use ingredients I can easily find and the results are delicious! Thank you sooooooo much Michelle! You are beyond helpful! These are sooo good. My family swears they’re better than any nugget they’ve ever tasted. Does anyone know how to make these if you are also allergic to eggs? Have tried dipping them in milk instead. Has anyone tried making these and freezing for quick and easy lunches? Just curious on how to do that! Thanks! I haven’t tried it, but that sounds like a good idea to try! Let us know if you do and how it turns out. I noticed most of your recipes use almond flour. I am allergic to almonds, pecans, and walnuts. Is there any other flour you recommend to replace the but flour? I am excited to try your recipes! Unfortunately I don’t have the perfect substitute for almond flour… some have tried flax meal or simple a gf all purpose type flour. Please let us know what you try and how the recipes work out for you. People are always looking for substitutions, so I’d love to hear back from you! OMG! So good! I can officially say that we’ve found a new dinner staple! :D Have you tried this technique with any other types of meats? Like pork or fish or anything? Teri, I have only used it on chicken and pork. However, fish sounds like a really good idea too. Let me know if you try and how it works out! These are delicious! I didn’t have the almond flour so I just did it by dipping in garlic butter and “breading” with the parmesan cheese, still came out great! Love this site! Am preparing gluten free food for my friend to have as she recovers from surgery. Wondering about the freezing of this recipe as well as suggestions as to what other main dish recipes here freeze well. I think it would freeze fine. I would just reheat again in the oven to make it crispy again. Let me know if you try! Thank you for posting this!! My teenage son was just diagnosed with celiacs disease and one of his first questions was could he eat Chik Fila. There has been SO much info to out there and SO many things to try but this is simple enough and I can’t wait to make it!! Thanks Mariah, I try to keep going gluten free simple and an easy transition. I hope for the best for your son, the first few months can be tough, especially for a hungry teenager! I just finally made these and they were absolutely phenominal!! Thank you!! Excited to try these & super excited that I just found your website!!! One of my twin daughters has to eat gluten-free as part of her treatment for chronic mold illness from a renovated home we purchased that had toxic mold. Due to the extreme stress and illness from living there for three years (not knowing about the mold), she has become gluten intolerant. Anyway, wanted to let everyone know that Chick-fil-A does have a pretty extensive gluten-free menu and their preparation procedures are written to avoid cross-contamination. (Of course, one can never be sure unless you prepare it yourself but anyway…) We eat there occasionally, and our entire family loves it. The waffle fries are gluten-free as are the grilled nuggets :) Check it out. For those of you wo need to eliminate the almond meal, try this with just the egg wash followed by a dip in parmesan, you will love i! Fish is great done this way also. I believe one of Chick Fil A ‘s tricks is to soak the chicken overnight in buttermilk which gives it that extra juicyness. Great dish, thanks. Have you tried any of your dishes using guinoa flour? This site waѕ… hoω do Ι say іt? Relevant!! Finally I’ve found something that helped me. Many thanks! This chicken was delicious! The entire family loved it, thank you for the recipe! Thanks for the positive feedback Katie! Everyone in the house ate these and went back for 2nds! Yay!! One week of gluten free eating and I personally feel better. Wild how sensitive my body is. Those look GREAT! Any idea what I can sub for almond flour? We have a nut allergy in the house. Have you used rice flour? Thankyou so much for your blog. I am new to gluten free world with two small children that have to be gluten free. After about 6 months of looking around this has really helpped. I really appreciate it.